If you’re looking for a solution to your expensive and failed thread roots in drill string connections, CJWinter can help. CJWinter is the industry leader in cold root rolling, which is the process of burnishing the root radius of a previously cut thread, in a Rotary Shouldered Connections. Cold root rolling is one of the simplest, most cost-effective ways to drastically reduce the likelihood of a failed connection. That said, what is so special about CJWinter’s Cold Root Rolling product line? Ever since our company’s founding in 1956, our goal has been to deliver the best commercial grade tools to our customers. We are the industry leader in providing high-quality thread rolls, the most competitive pricing, and the fastest turnaround times. Our Cold Root Rolling products are simple to use and program. We offer commercial grade tools and pride ourselves on our compact, robust products. 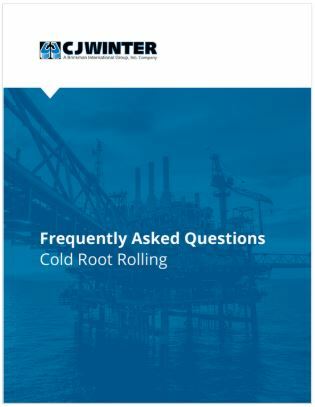 We provide the only cold root rolling products that hold NS-1 level 2 accreditation, meaning that CJWinter’s cold root rolling tools holds a higher quality and competence that our customers can rely on when using them in the most difficult environments and tough operational stresses. Let’s further talk about our Cold Root Rolling tools themselves. Our products allow users to simply adjust pressure and they operate at a one-to-one pressure ratio, meaning that the pressure on the gauge is pressure applying to the root. Our tools are compact and durable. They do not require an external pump and the spindle does not have to stop for use. Customers also are not required to have a hoist to hold the tools. In addition, we supply self-contained hydraulic tools. On our tools, there are four positions to mount the gauge and there are no safety issues with hoses. Ultimately, we carry high precision Cold Root Rolling tools that we are proud to deliver to our customers. At CJWinter, we are happy to provide the proper certifications for our customers’ needs. As a starting point, we provide certificates after training—along with our gauges. Our products are ISO 9001:2008 certified. Your purchase of any of our products comes with superior customer service. We offer in-house factory customer support to answer any of your questions. We also provide field service support should you require assistance on-site. CJWinter does limit on site training to the United States and Canada and most of Mexico. We are flexible in our goal to solve customers’ problems. We manufacture cold roll wheels not just for CJWinter’s line of cold rolling products but, for competitors’ tools as well. CJWinter can supply cold roll wheels that meet DS-1 or non-DS-1 specifications. Simply put, we love to satisfy our customers, so we are happy to go the extra mile to ensure that all of your needs are addressed. Along with all of this, if you are looking for more information about our products, you can visit our website. Our website contains technical data, how-to videos, detailed how-to product manuals, and informational guides. We also have a robust FAQ page, but if you have any additional questions, we would be happy to work with you. We pride ourselves on our quality cold root rolling products and our exceptional customer service. Our 60 years of experience allows us to provide the best oil field and drilling tools to help you prolong the service life of drilling connections and solve other pressing problems. If you’re interested in more information, please contact us today or call 800-288-7655.